Not only will you enjoy breathtaking views of the Illinois River Valley, but there are also a wealth of natural, cultural and historical sites to explore. The Illinois River Road follows routes along both sides of the picturesque Illinois River connecting communities from Ottawa to Havana. Travel the historic route and explore over 78 unique waypoints along the way. The Illinois Department of Natural Resources is at the helm of efforts to manage the state's natural and cultural resources. 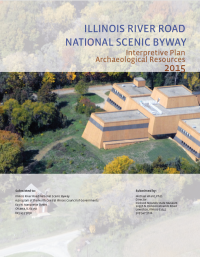 The IDNR manages over 55,000 acres of land at 15 sites along the Illinois River Road. These locations provide visitors with hiking and biking trails, boat ramps, camp sites, fishing lakes and public hunting grounds. These restoration projects are critical to retaining the health and biodiversity of the Illinois River Valley. This downloadable guide details the top five areas where these conservation and restoration efforts have had the most impact. Visit these sites to see conservation in action! Bookmark the Illinois River Road mobile tour to guide you while on your trip. 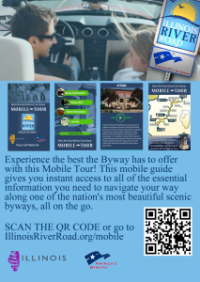 Experience all the scenic byway has to offer with all the essential information you will need right from your mobile device. This interactive guide details places to stop and things to do during your trip. The communities along the route boast numerous places for hiking, biking, hunting, fishing and other outdoor activities. These communities also offer unique places to shop, eat and stay that will leave you wanting to explore even more. 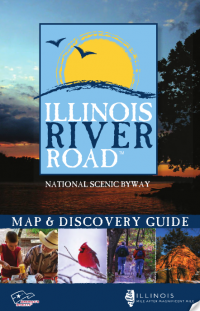 This complete map details the Illinois River Road route along with communities and sites along the route. Download the route map and site guide for a helpful addition to your trip. 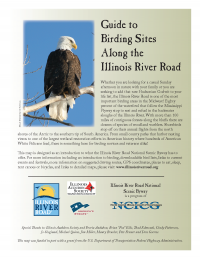 With more than 100 miles of contiguous forests and backwater sloughs, the Illinois River is one of the most important birding areas in the Midwest. Shorebirds, woodland warblers, waterfowl, pelicans, eagles, and many more species can be found along the Illinois River. This guide details the top ten birding sites and trails plus information about seasonal birding. 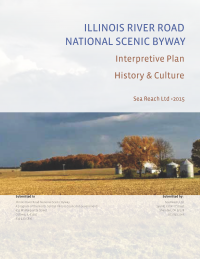 This interpretive plan helps to illuminate and connect destinations and sites along the Illinois River Road. This book details the history and culture of the Illinois Valley along with the best ways to experience all the Illinois Valley has to offer. The Illinois River Road National Scenic Byway includes nearly two dozen places where the public may travel through time to the distant past when Native Americans, European and then American settlers made this place their homes. This interpretive plan provides context for historic life through the river valley and much more. 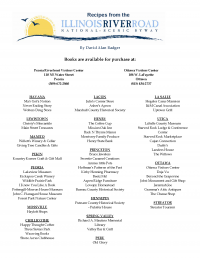 Download this guide to find locations to purchase A Taste of the Region - Recipes from the Illinois River Road by David Alan Badger.